Obergurgl boomed with the development of Innsbruck Airport as a charter destination. Its location as one of the highest permanent villages in the Alps and the relative proximity of the airport (around 90 minutes on a good day) meant that the resort quickly became a big favourite on the British ski market. Obergurgl positioned itself as an upmarket resort (locals still look down their noses at the brasher and larger neighbour down the road in the shape of Sölden) and the development of accommodation and infrastructure in the village has been swayed by that goal. Competition amongst the hotels has led to high standards of accommodation and facilities, although it must be said that the winter prices match those levels. Nonetheless, it remains a popular resort for those who are looking for a fabulous snow record (if Obergurgl ever doesn't have snow, there are going to be few resorts in the Alps which do) and the proximity of Sölden helps to take away the day-tripper crowds and results in a resort where it is rare to get caught in a long queue for a lift. Obergurgl is the kind of resort which draws a regular crowd of fans, many of whom return year after year. It doesn't have Tyrolean charm and it doesn't have the expanse of the larger ski areas but it makes the most of its advantages. Although the holiday brochures tend to be full of the more upmarket establishments, it is possible to find guesthouses and apartments in the village (see the Hotels and Travel tabs above for details about booking your own accommodation and making your own way to the resort). Location: Obergurgl is located at the end of a long mountain valley heading south from the Inn valley in the western part of the Tyrol. Access: Obergurgl can only be reached by one road in the winter months and the resort is one of the highest in Austria. The skiing in Obergurgl isn't going to match resorts such as St Anton or Kitzbühel for difficulty or scope. But for holidaymakers who are looking for a good-sized area with excellent access to the slopes and guaranteed snow, it fits the bill down to the ground. Most people stay in Obergurgl and there are two connected areas above the resort. The first is the area below the Hohe Mut. Those who are less than advanced skiers can get off the lift at the mid-station and enjoy the shorter runs off the two chairlifts. What used to be off-piste ski routes have become formal red runs with the building of the lift to the top ridge and good skiers will find this a nice area to warm up on. The second area is the Festkogel, which is essentially a big bowl above the village with runs back to resort on either side. There are some trickier red pistes in this area and the blues are probably some of the more crowded and difficult in a resort which doesn't tend to get overrun with people on the slopes. The connecting lift across to Hochgurgl leaves from below the top station of the Festkogelbahn. Hochgurgl is the higher more exclusive (and expensive) hamlet with a wide range of mostly intermediate slopes above the treeline. There are long and winding blue runs criss-crossing the slopes above the resort. One tip when everyone is trying to get up the slopes in the morning is to hit the red run down to Untergurgl while it is in good condition and with few people on it. Further up, the Schermerbahn chairlift accesses a long and interesting red and the long black off the Vorderer Wurmkogel chairlift can be quite challenging if there is enough snow on it (even more challenging when there is not!). The total Obergurgl-Hochgurgl area has 24 lifts and covers more than 100km of terrain. A day pass will cost 52 Euros in the main season. A six-day pass will cost 285 Euros in the main season. Cheaper price dates are available for the pre-Christmas period, from mid-January to the end of the month and from the last week in April. Beginner skiers and families will find the runs from the mid station of the Hohe Mut lift and over on the chairlifts beyond to be the best areas for gaining confidence on easier slopes. There is also a good network of less demanding runs above Hochgurgl. Obergurgl and Hochgurgl are excellent for intermediate skiers. Almost all of the area is suited to this level of skier, with much of the skiing on well-pisted open areas and access between Obergurgl, Hochgurgl and Untergurgl simplified by good lift connections. Advanced skiers will find the run off the Hohe Mut, the routes to the left of the Festkoglbahn looking up and the Vorderer Wurmkogel area over at Hochgurgl to be the biggest challenges (the much-publicised short Wurmkogel run is just steep). Other than that, the resort is excellent following fresh snow, with stashes remaining for a good while after a fall. 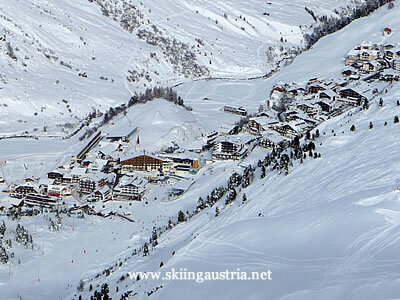 Even though it is a small and high ski resort Obergurgl manages to split its accommodation into three different areas. The smallest of the three used to be called Untergurgl and is located near the bottom of the gondola up to Hochgurgl - it's now known as part of Obergurgl as the rest of the village creeps ever closer to it. Hochgurgl, the highest of the three, is pretty much an upmarket ski-in ski-out hamlet. You don't get much in the way of nightlife but you do get to ski back to the terrace of your four- or five-star hotel and get a head start on other skiers at the start of the next day. The main area of Obergurgl stretches from the Festkogl gondola base station area past the bottom of the Hohe Mut lift and up onto the road towards David's Skihütte. There are two levels to the village and it is possible to ski back to the majority of the accommodation. Most of the hotels are four- and five-star with a scattering of smaller three-star family establishments and guesthouses. There is a limited and popular supply of apartment accommodation, mostly in the lower part of the main village or on the high road out towards the Gaisberg ski lifts. The search box to the right (or below if you are using a smartphone) gives an availability check for particular dates for all of the accommodation in Obergurgl. Innsbruck has long been a favourite of British skiers who were attracted to it by the availability of a wide range of charter flights through Innsbruck airport. Innsbruck still remains by far and away the easiest choice for those flying in for a ski holiday. The two smaller German airports don't have a wide range of destinations, while Salzburg, Zurich and Munich are all getting on for 300km away and probably most suitable for those who are thinking about renting a car. Transfers from Innsbruck can be made by public transport (there is a local train service from Innsbruck centre through to Ötztal Bahnhof and then a bus up to Obergurgl which runs until early evening) or by ski bus which runs three times a day (four on Saturday) from the airport. Those planning on using public transport from other destination are best advised to take the train to Ötztal Bahnhof in the Inn valley and then use the public bus as described above. Those who are making their own way by car should ensure that they have proper winter equipment (winter tyres and snow-chains in the car) as the route will involves narrow mountain roads and a rise in altitude to nearly 2000m. Obergurgl is at the end of a valley in the winter time (the Timmelsjoch route into Italy which may appear on some mapping devices is only open in summer) so drivers from all directions will need to get onto the Inn valley motorway in the direction of Ötztal Bahnhof to the west of Innsbruck. From there it is about 50km up the Ötz valley which climbs around 1300m in stages until it reaches the end of the road at Hochgurgl. The road can be crowded on weekends and tricky for those unused to mountain driving in bad weather. The ski season opens for winter 2017/2018 on 16 November and runs through to 22 April.